If there's one thing we know about clowns, it's that they're pretty polarizing. People either love them or they really, really, really hate them. You're either a ray of sunshine to a birthday party full of kids or you're the stuff of nightmares to even grown, job-holding, tax-paying adults...the highlight of the circus, or the most dreaded addition to a Halloween Horror House. And we're going to be honest with you: this mask is not the kind of clown look that's going to inspire lots of laughter and smiles from those around you. So if that's the look you're going for...we've got some rough news, friend. 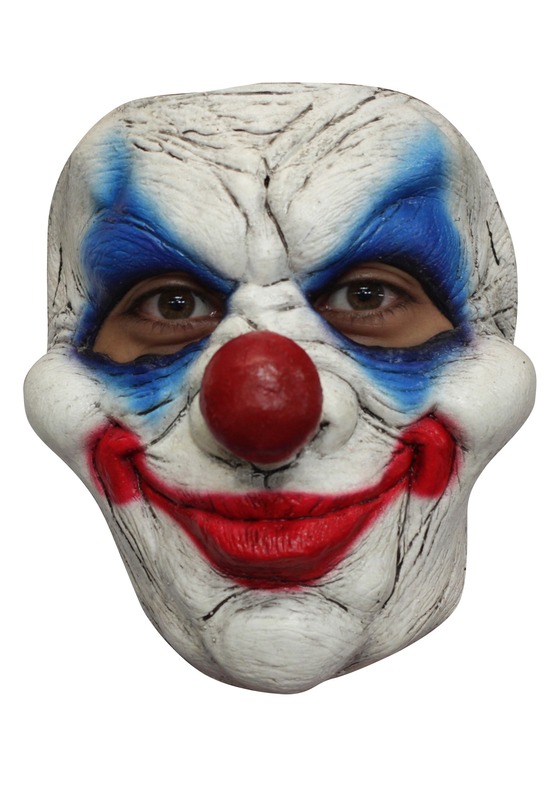 This is not the clown mask for you. But if you're looking for the kind of clown face that will confirm most people's worst nightmares? Have people screeching in terror at the sight of that smile? Make kids run away from you in fear (admittedly an attractive trait to most grown-ups)? Trigger some unlucky pal's worst phobia? Then you're in luck! With it's ultra-creepy cracked white cake makeup, smeared blue eye color, and the kind of red mouth that no one in their right mind would ever want to pucker up to, you'll be tickling people's terror bones all over the place. So if paralyzing fear's your gag, slip on the Adult Clown #5 Mask, add a frazzled, brightly colored wig to complete the look, and maybe even up the scare factor by carrying a toy weapon (after all...much like the general populations reactions to them, clowns aren't known for doing anything halfway).